The Belize Audubon Society awarded Tony Garel, who has worked with the Belize Zoo for almost 3 decades, the James Waight Conservation Award. The award recognizes one's outstanding contribution to the field of conservation in Belize. Congratulations, Tony! In a ceremony held last evening at the historic Chateau Caribbean Hotel, Mr. Tony Garel was honored with the prestigious James A. Waight Conservation award. Mr. Garel was recognized for his outstanding contribution to the field of conservation in Belize, namely in the area of reptilian conservation and education. Mr. Garel is the author of Field Guide to the Snakes of Belize and the curator of the snake educational display at the Belize Zoo. "According to Sharon Matola, Director of the Belize Zoo, 'one of Tony’s most outstanding accomplishments was the design and development of the wheelchair accessible walkway at the Belize Zoo which has enabled hundreds of wheelchair bounded Belizeans, especially children, to easily view native wildlife.' Mr. Garel has been working at the zoo for over 25 years, and has assisted with all of the conservation programs at the zoo." 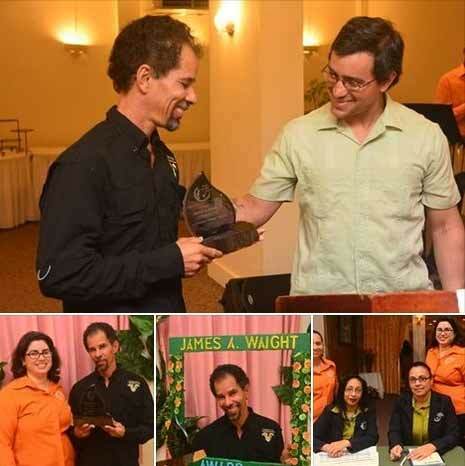 The James A. Waight conservation award, named after the Society's first president, is given on the anniversary of his birthday, February 16th, to organizations or individuals in recognition of dedicated, positive work in the protection and enhancement of Belize's environment. Standing ovation for Tony and all he has done!